The J-50 appeared in 1942 as a ‘higher grade’ version of the J-45 and the Gibson J-50 Koa is a slight variation, with Sitka Spruce top and a spectacular set of Hawaiian Koa for the back and sides, and an Ebony fingerboard and bridge. The primary difference between the J-45 and the J-50 is the use of visually higher graded woods, allowing the J-45’s sunburst to be replaced with the J-50’s natural top. 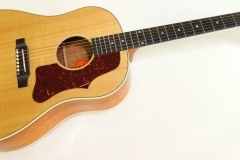 The J-45 and J-50 models are based on the combination of a Spruce top with Mahogany back and sides. Koa is a member of the Acacia family, and has a striking visual appearance, often being highly figured. Like other Acacia woods, Koa is somewhat harder than Mahogany. Still, it produces a similar tone but with clearer, more complex brilliance. 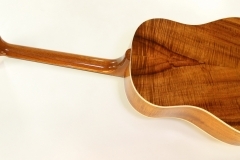 Koa in the sizes required for guitar bodies is not in great supply, so when we see guitars like this one, it’s likely part of a special production run. This guitar is on overall very good condition, with a nicely preserved natural gloss finish. Wear to the frets or ebony fingerboard is negligible. Tonally, it suggests the warmth of the round-shoulder dreadnought, but with more crisp, bright and complex top end. However, I suspect that this particular piece has hardly been played – the pickguard still has its protective plastic! – and it should open up significantly with use. As most Gibsons from this time and on, an L R Baggs Element pickup system was installed at the factory, with the controls discreetly inside the soundhole.